Based out of Chapel Hill, N.C., Catherine French Design works with clients on a wide range of Interior Design services for projects all along the East Coast. From inspiration to installation, Team CFD can do it all. We realize that each project and client is unique and want to help you realize your home or office dream environment. We will meet, see the space, and provide you with a custom quote depending on the needs of your project. This is ideal for longer-term projects needing more project management, including renovations, new construction, or furniture purchasing and installation. Full service interior design includes a color consultation, creation of a space plan, drawings for a contractor, mood boards, budget creation, sourcing and shopping, purchase management, installation and styling. Let us do the heavy lifting for you. 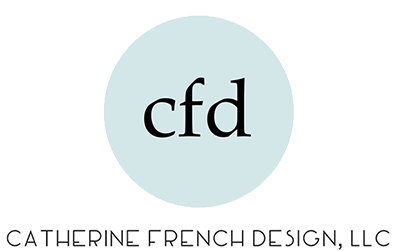 To get the process started, send us an email to hello@catfrenchdesign.com or reach us by phone at 919.537.8148. Fast, Fun, Budget Friendly! Our E-Design services are perfect for someone who enjoys a little DIY, isn’t in our neck of the woods, or just needs some good ideas to get your project on track. We provide you with a roadmap to completing your space, including a design vision, shopping list, and helpful styling tips! Have that small project that needs that professional touch? Just moved and need help figuring out the perfect layout? Or just want help getting a space re-fresh? The Afternoon Design Session maybe perfect for you. We offer furniture rearrangement, styling and accessorizing, artwork installation, paint consultations, or help in selecting that perfect missing piece. Up to three hours in your home with two members of Team CFD. Perfect for those in the Carolinas.